Presenting at the university conference BIN@Porto does not contribute to your curriculum and the delegates have little chance of meeting their peers. However, participating does offer unexpected encounters and new opportunities. The Dean of the Faculty of Engineering of the University of Porto (FEUP), João Falcão e Cunha, starts his opening speech with apologies for the late start of the conference. The Dean of the Faculty of Engineering of the University of Porto (FEUP), João Falcão e Cunha, starts his opening speech with apologies for the late start of the conference. This isn’t because the speakers or technicians weren’t ready on time, he stresses, but because a large number of participants arrived late. While studying the programme, I did find the half-hour check-in time remarkably short, so I am not entirely surprised. Another striking thing was the lack of a cloakroom. This appears to be a recurring problem the next three days, so every time you enter a location you see participants hesitating about what to do with their coats. 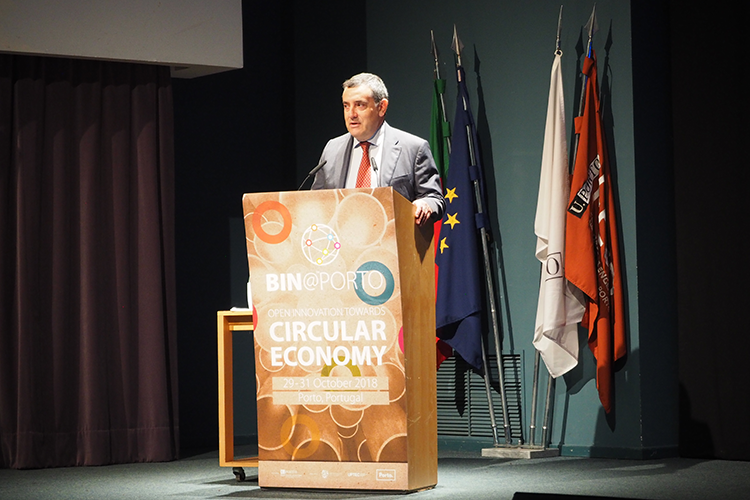 The second welcome speech comes from a representative of Bondalti, Portugal’s largest chemical company and premium sponsor of this conference on circular economy. The convenient and stylishly made programme booklet shows another sixteen sponsors, with internationally renowned names such as IKEA, IBM and Deloitte. The two golden sponsors are LIPOR, the company responsible for the management, recovery and treatment of the Municipal Waste produced in Greater Porto, and The Navigator Company, an internationally operating company of Portuguese origin that produces pulp and paper, and is also responsible for half of Portugal’s energy production from biomass. 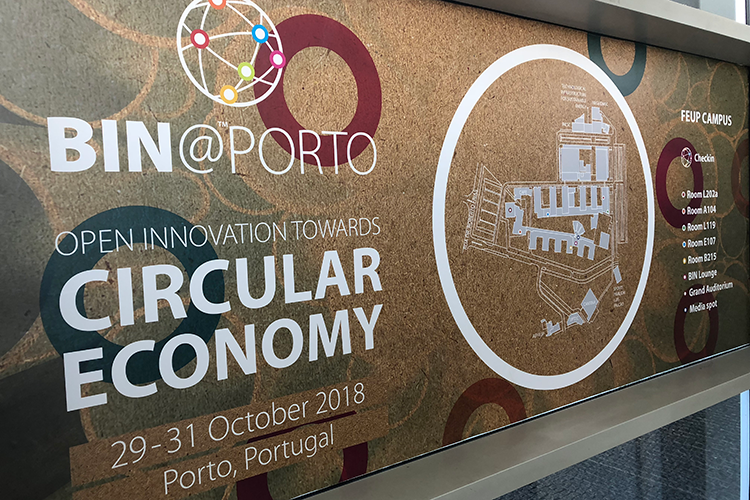 All these sponsors ensure that attendees at BIN@Porto do not have to pay to participate in the conference, with free catering and side events on invitation. We also get a third introduction at the start of the conference, by means of a video message from Violeta Bulc, the European Commissioner for Transport. Later I learn that she has become a real ambassador of the conference since she opened BIN@Porto three years ago. Something that seems to happen to more participants. Next, we really move on to the content. In a series of sessions of half an hour, speakers give their view on circular economy. Stories that don’t make you happy at first, because every hour a truckload or plastic disappears into the ocean, we currently consume the equivalent of 1.6 earths per year and are expected to produce 3 times our home planet by 2030 and the risks of global warming are numerous. Fortunately, we are also presented with possible solutions that institutes and companies are working on. The stories are supported by often richly filled and sometimes very colourful schemes and enumerations that are projected just a little too big on the large screen of the auditorium. But the stories are clear and interesting. 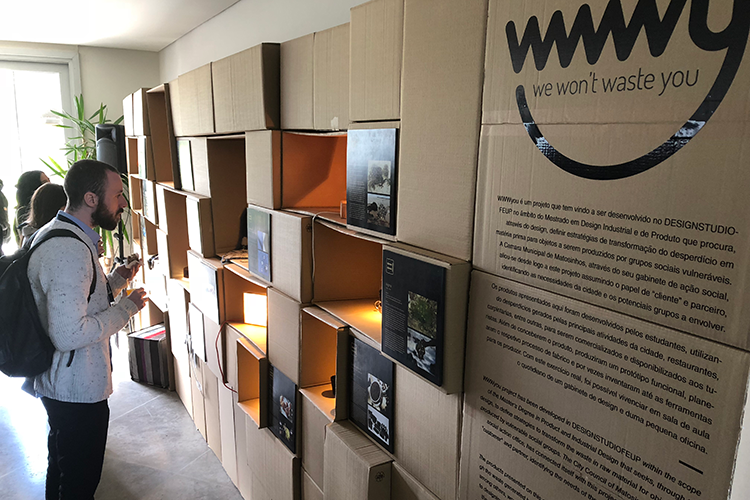 In the lounge we can also see the exhibition ‘We Won’t Waste You’, with examples of products produced from waste. Coffee and lunch-breaks are held in the lounge a little further away. The clear and recognisably styled signs make it easy to find. Fortunately the outside doors of the lounge can remain open, despite the cold weather of about ten degrees for Porto. The space alone would have been too small for such a large group. In the lounge we can also see the exhibition ‘We Won’t Waste You’, with examples of products produced from waste. Thanks to the cancellation of one of the speakers and the quick presentations of four sponsors, the day programme of this Context Day ends on time. For those who registered for the evening programme there is still enough opportunity for a sanitary stop or a few phone calls before the bus leaves. Vestas impresses the guests by the 3D projection of the inside of one of their windmills. The buses of the city of Porto, recognizable by the shades of blue icons – introduced in 2014 as a new design for city marketing – take us to the Lionesa Business Center. Here, in a former textile factory, many scale-ups are located which is so successful that new buildings will be added to meet the demand. Graffiti on the exterior walls, original seating on drawn rugs in the central corridor and a collective cafeteria with swings and foosball tables expose the creative vibe that reigns here. Lionesa houses a colourful collection of companies and small businesses that are mainly busy growing quickly. We visit three of them. Vestas impresses the guests by the 3D projection of the inside of one of their windmills. Here, designers and technicians can check whether all conceived elements fit into the housing and can be operated. Kuanto Kusta is on the eve of the launch of her new business model. Until now, the online marketplace worked purely as a collective display window, where suppliers were charged on the basis of costs per click. Now, however, the company will take care of the handling and service itself and will receive a percentage per sale. More margin, but also more risk, says one of the directors, but also a necessary step to maintain future prospects. The third company is Retail Consult. The name says what the company does, noting that it specialises in the application of new technologies in stores. And apparently successful, because the company continues to grow tremendously and already employs 400 people. The second day of BIN@Porto has been named Impact Day. In lecture halls suitable for about 60 participants, specific technical developments are discussed in so-called Action Tanks. I join the session where three speakers talk about their projects in the field of energy from renewable sources. 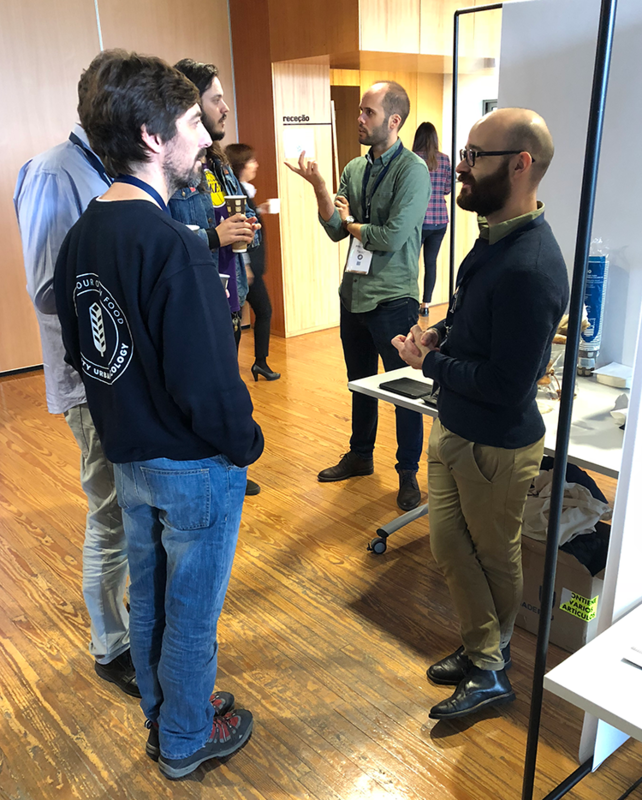 When the second round of sessions starts, organiser Pedro Coelho – who works as R&D and Innovation Officer at FEUP – takes plenty of time to explain this extraordinary conference to me. The conference circulates between the Portuguese Porto, Brazilian São Paulo and English Sheffield, a combination of cities that didn’t make a lot of sense to me in the beginning. “It’s also partly a coincidence,” says Coelho. “As universities, we have already collaborated in the past with a number of projects concerning the soft landing of start-ups on a case to case basis and so the idea was born to make a more sustainable forum for sharing good practice and opportunities in innovation. We signed a memorandum of understanding and organised BIN@FUEP in 2010. In the Business Innovation Network, academics, investors and start-ups work together on innovation. The same mix can also be found among the participants at the conference, who also represent a wide variety of disciplines. Previous themes of the BIN@ conferences were for example health technology, smart cities, digitalisation, and industry 4.0. This mixed composition of participants also determines the structure of the conference. “The open sessions on the first day are for framing the theme from different perspectives,” Coelho explains. Today the twelve action tanks are about the application of new technologies, not about the science of how they work. It helps that Coelho is a graduate economist himself, he says. Because he has no technical knowledge or preference, he can make a neutral selection from potential topics and speakers. Tomorrow will be Brokerage Day. A day full of scheduled meetings, a fair and group debates. A day where new connections are made and plans for collective projects are created. It is not so much the content that is central, but the personal relationships that are the focus of this conference, Coelho emphasises. The BIN@ platform facilitates the contact that should arise between the various market parties and disciplines in order to achieve more cooperation in the field of innovation. Consciously there is also no fishing for financial support from the EU, the organizer continues. “How many of the projects funded by the EU really endure? If funding is stopped after 3 years, a project loses momentum and the people involved start doing something else. Our network is all about people, and of course it’s an advantage that it’s part of our daily work. It is our role to facilitate a platform like this. Coelho’s dominant role is limited to this conference. 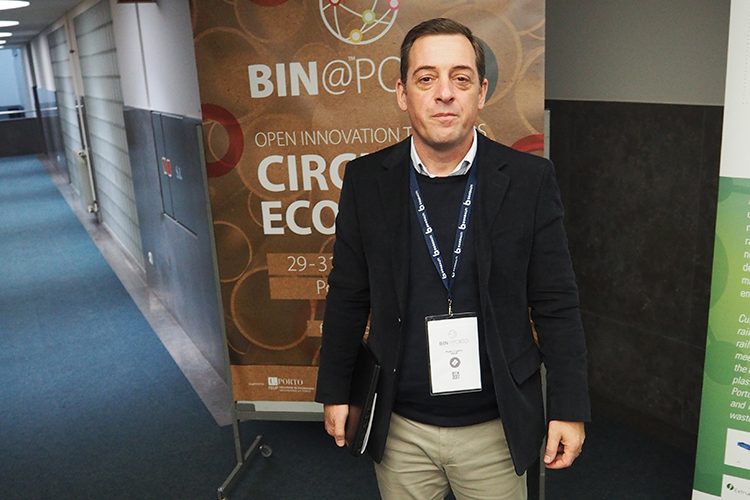 For BIN@ conferences outside of Portugal, Pedro Coelho only is an advisor. It is always the local team that decide everything about the conference. 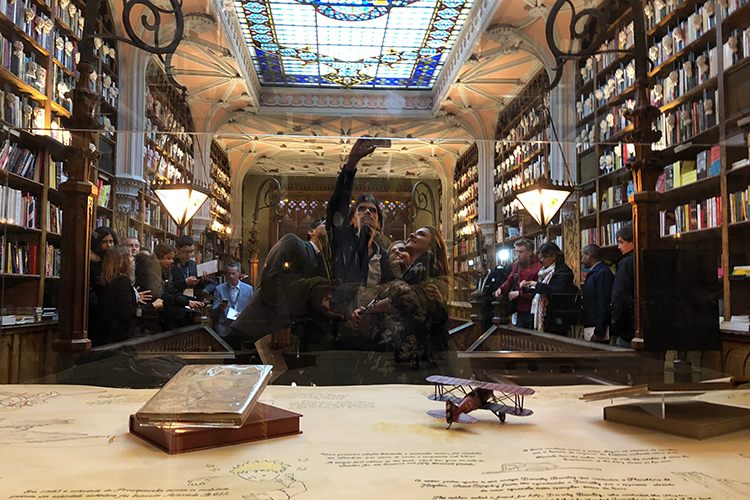 The 111-year-old Livraria Lello bookshop was reportedly a place where J.K. Rowlings worked on her book Harry Potter and the Philosopher’s Stone. Of course, a traditional conference dinner is also a good method to promote mutual contact. The bus drivers skilfully guide us through the busy traffic to the city centre. We do not go directly to the dinner location: a special stopover awaits us. We gather in front of the Livraria Lello bookshop. This 111-year-old bookstore was reportedly a place where J.K. Rowlings worked on her book Harry Potter and the Philosopher’s Stone. It takes little imagination to understand that she got some of her inspiration from the special interior. 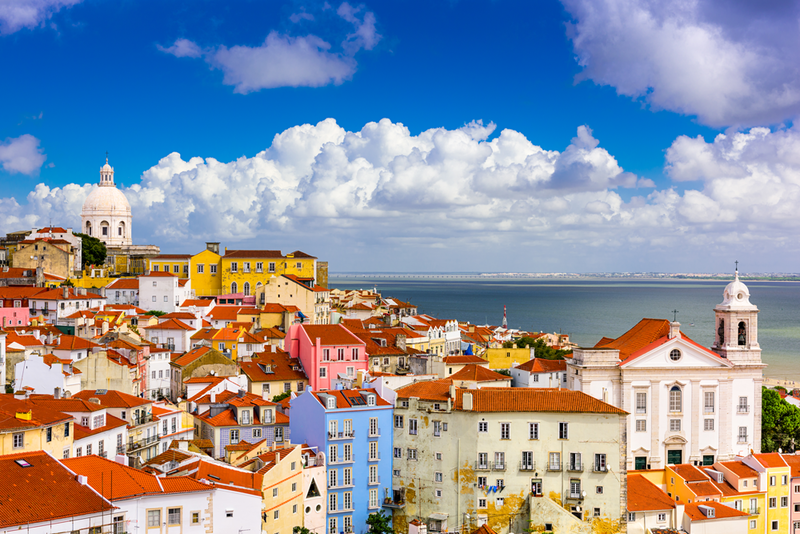 And that goes for the entire city centre, with its steep cobbled streets and generously decorated classical buildings with glazed tiles. A city walk with a visit to the bookshop is definitely recommended. Our next stop is the five-star Pestana Palácio Do Freixo hotel. On the website you can read that this National Monument, a unique example of Baroque architecture, boasts approximately 10 thousand m2 of gardens and green spaces offering breathtaking views of the River Douro. The accompanying photos endorse this stature. We cannot judge the location in all its grandeur now that it gets dark, but the interior of the reception room gives us an indication. Here we drink a glass of port – with our coats on or hanging over our arms. After that we walk to the dining room, where I even notice a mobile wardrobe. Gastronomically and in terms of service, the evening is conducted according to the rules of the art. An award will be presented, as well as the location for the upcoming BIN@. In 2019 this will be the Brazilian Ribeirão Preto, located 300 kilometres from São Paulo. Pedro Coelho explained to me the day before why the home base of São Paulo University was not chosen. The metropolis of millions poses too great a logistical challenge for a conference that often covers several locations, with travel times of up to more than an hour. When you can walk to the venue, everything is much simpler, Coelho said to me. The mid-term conference is also announced. This is a more compact conference of about a day and a half that is organised annually in the summer and often takes place in other university cities, such as this year in Gliwice, Poland, and in 2017 in Targoviste, Romania. In the central hall of UPTEC there is the exhibition, where about twenty companies show their innovative products. On the third day, UPTEC is the conference location, the Science and Technology Park of the University of Porto, located a stone’s throw from FEUP. In the central hall there is the fair, where about twenty companies show their innovative products. I meet two table companions from yesterday, an Englishman and Canadian, who both enthusiastically talk about the interesting conversations they had with the exhibiting companies. For lunch we can use our catering vouchers to buy from two food trucks. I choose the (holy) crêpe with plenty of cheese. Then there are the presentations from the workshop, which was offered as a parallel programme. As often mentioned on this platform, workshops are generally ennobled presentations, but at BIN@ this certainly does not appear to be the case. It was a real Hackaton, in which the participants were challenged to come up with (design) solutions as a team to tackle some of the 17 sustainable development goals identified by the United Nations. And so we get four interesting presentations. Next, some start-ups present themselves. Halfway through I decide to move on to the debates (and forget to bring my jacket, so I have to pick it up later from the auditorium). The debate concerns in particular the financing of research projects and innovation parks by the industry. 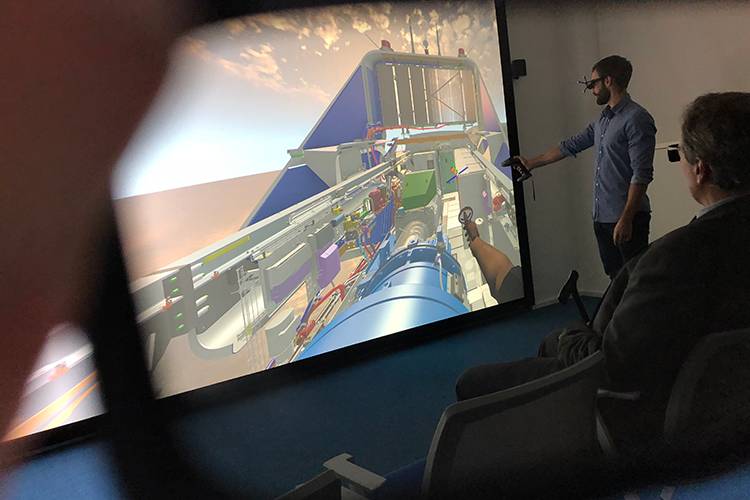 This has increased enormously and leads to the classic debate about whether this gives companies too much influence on the research programme, which is therefore limited to commercially interesting innovations and offers too little room for unexpected discoveries. 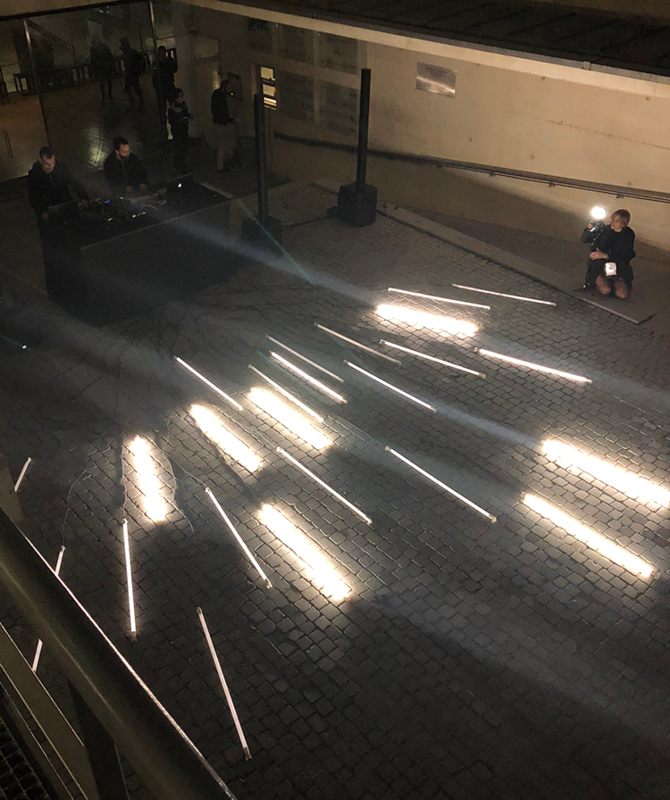 The Loop Farewell Party with a multimedia performance, with flashing fluorescent tubes as an eye-catcher. BIN@Porto is collectively concluded with a beer, roasted chestnuts and bifanas (pork sandwich according to Portuguese recipe), while Openfield – Creativelab adorns the Loop (referring to the artwork in the front garden of UPTEC) Farewell Party with a multimedia performance, with flashing fluorescent tubes as an eye-catcher.